I haven't done a make-up-slash-tutorial post in quite a while and had an urge to do one today on a look that has become really popular lately. 'Ombre' according to the French dictionary here, means, 'shade/shaded/shading'. In fashion and beauty, ombre relates more to graduation of colour in which one shade turns in to another shade. I'm sure you all know how much ombre is used in the world of fashion and beauty now, especially in relation to hair, nails and clothing. It's also been massive on the catwalk as well this year. There has been so many colour combinations and somehow I don't think the look will be disappearing any time soon. One look of ombre I've really taken a liking to is, 'ombre lips'. I've seen tonnes of Youtube tutorials surfacing on to the internet and loads of people have been trying the look out and posting pictures on Instagram so I thought I'd give it a go. I don't think I'm that adventurous to try out some of the colour combinations I've seen (e.g. Orange and Pink/ Green and Pink) but I love Red ombre lips to achieve that velvety look. I have to say it isn't super quick to achieve and does take some time and precision to get it looking really good if you're not a professional make-up artist like me. Even though I've done it a few times now, I still find it tricky. Above is a picture of the products I use to create the lip colour. The first step, I feel is really important. Before you apply any colour, the lips MUST be really hydrated. Otherwise when you apply the matte lipstick on top, it will accentuate any cracked or dry areas on your lips. I use, Blistex Relief Cream on my lips for about half an hour before I apply the lipstick. This stuff is really amazing at moisturizing the lips and has a nice tingly feeling. Most importantly, it gets all the dry skin to become really soft so you can just sweep it away. Next, I use, Maybelline Coloursensational Lip Liner in number 547, 'Pleasure Me Red' in which I begin to outline my lips. Even though I have a steady hand I find it hard to get the lip-liner to look just right so make sure you take your time and ALWAYS make sure the pencil is super-duper sharp otherwise you won't get a nice line to show-off your lip shape. The lipstick I use for this look is one of my all-time favourites, MAC's Matte Lipstick in, 'Ruby Woo'. I love this shade, for me it's the perfect colour for a distinctive red lip. Once you've lined your lips, apply this to the rest of your lips being careful around the edges. It is a matte lipstick so you probably will find that it drys out your lips when you wear it all day but it does last hours. To achieve the ombre look, in the corners of both the upper and lower lips I use, MAC's Lip Pencil in, 'Currant' which is a dark Plum/Purple shade. Do not go to far in the center with this as you want that to be Red only. Make sure you use a lip brush to blend the two shades together and once you've done that you should be left with a lovely ombre lip! My finished look is below, it's still not perfect but I'm hoping practice will fix that. 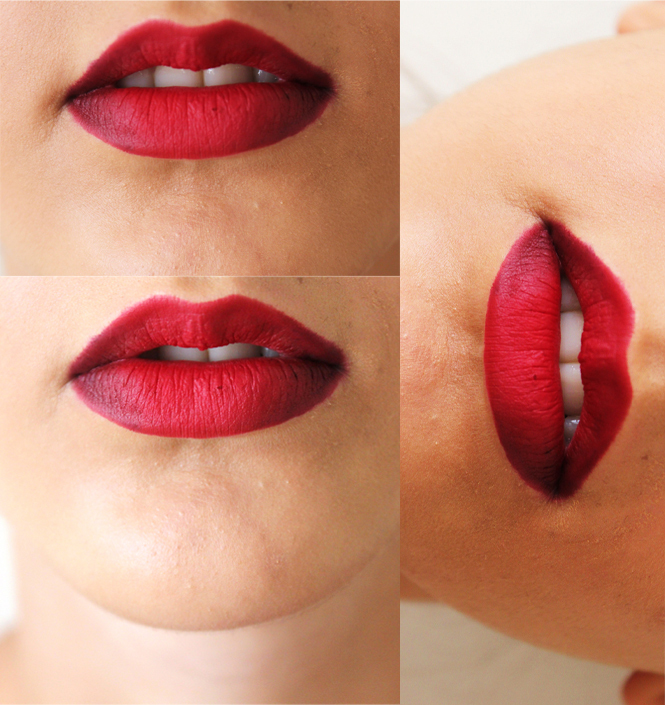 Have any of you tried an ombre lip? So this is my final outfit post from my holiday. It was actually the first outfit I took photos of but I just decided to put this up last not for any particular reason though! I think it's fairly obvious that I have been in love with midi and maxi skirts this summer as all of the outfit posts I've featured have included them haha. They're also so easy to wear in the heat and don't leave you feeling horrible and sticky. I bought this necklace quite recently from New Look so it should still be in stock. It's one of those accessories that can really make an outfit, especially with a plain top like the one I'm wearing. These rings I spotted in the Miss Selfridge sale for £1 each so had to get them as I can NEVER find rings small enough to fit my fingers but Miss Selfridge are one of the only shops I've found that do XS which is good for me! I have some beauty related posts coming up of products I've bought recently so they will be up soon aswell. Hey everyone. I've missed blogging so much! It's literally been over a month since my last proper post. I've been Tenerife and Cyprus which I loved. Feel so relaxed and refreshed now. I made sure I took some outfit posts because I've missed doing them and they're my favourite type of post to do. This outfit I wore in Cyprus on one of my last days. I always feel that when you wear either Black or White on holiday, it makes your tan stand out more, don't know if that's true but hey. I am seriously obsessed with midi/maxi skirts dresses this Summer and thankfully I got to wear them in Cyprus even though it was so so hot, 40 degrees and over everyday. I searched high and low for a White pleated Midi skirt for months on end and I really didn't want to buy one from American Apparel as they cost over £40. Randomly, I saw this from a seller on Ebay for £5 so I obviously had to get it and I loveeeeeee it so much. I thought this skirt would look best with a plain top like this one and my trusty bad gladiators. I have another two outfit posts coming up :) Have any of you been on holiday?